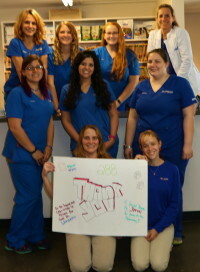 Animal Medical Center of Brooksville entered a contest while at NAVC. They obtained the most likes on Instagram and won $1000 in free products for the clinic! Thanks go out to Jorvet, and all the people that gave us a “like” enabling us to win! Animal Medical Center of Brooksville have selected new surgery gowns and thyroid shields for the clinic!